The founder of Toyota Motor's AMT training program says his company is changing the perception of career pathways in advanced manufacturing. WorkingNation consultant and workforce reporter Ramona Schindelheim reports on the innovative solutions for developing skilled workers for 21st-century jobs. Schindelheim interviewed Toyota Motor North America’s Dennis Dio Parker, whom director Barbara Kopple featured in WorkingNation’s FutureWork series. Parker is the developer of Advanced Manufacturing Career Pathways programs, which provide advanced skills training. Even before the jobs skills crisis became a part of our everyday economic conversation, Toyota Motor North America began developing ways to keep its workforce up-to-date and competitive. “We’ve been at it for 30 years. Within our corporate culture are the concepts of problem-solving and continuous improvement,” explains Dennis Dio Parker. 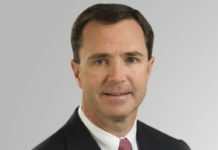 He’s the man in charge of Toyota Motor North America’s ongoing process of finding and training the high-skilled workers that keep the assembly lines at its nine U.S. plants running. 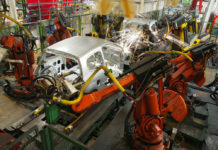 Early on, Toyota saw how advances in technology were changing the automotive industry and took a proactive approach. “Anybody working down here at this ground level knows what’s happening. We actually began developing the first training program back in late 1987, and we have been working on it ever since,” says Parker, whose official title is Assistant Manager, Toyota North American Production Support Center. He helped found and develop the company’s most-recent program—Advanced Manufacturing Technician (AMT)—which has graduated hundreds of high-skilled workers and has captured the attention of the entire advanced manufacturing industry seeking to solve its workforce problems. 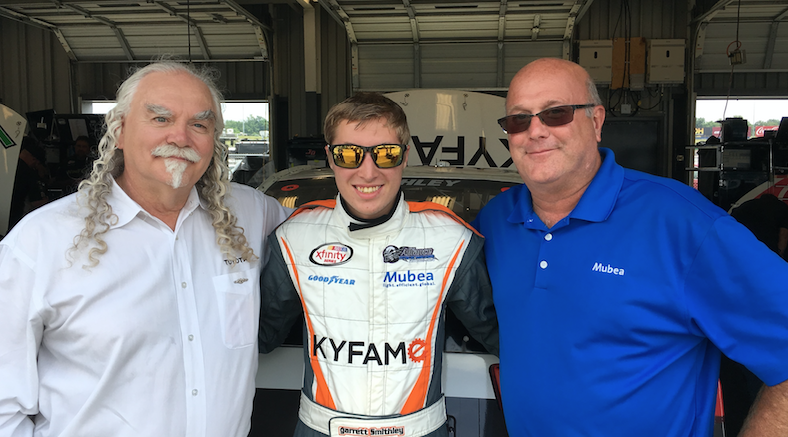 Parker (left) with NASCAR Xfinity series driver Garrett Smithley and Mubea North America Training Manager Drew Farris. Photo – via Kentucky Forward. It’s an oft-repeated concern in the business world these days: there are not enough workers skilled in the trades that are needed in advanced manufacturing—engineering, computers, robotics, machining, welding and more. Some of it is due to lack of training, some due to an aging workforce. 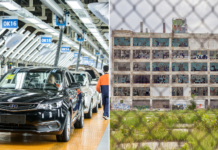 Parker points to the well-known Deloitte studies showing that manufacturing companies have 600,000 skilled jobs just sitting there empty because there are not enough people to fill them, and forecasting that the gap will grow to 2,000,000 by 2025. “It turns out that these new jobs require greater training, more knowledge, higher skills for understanding than the other jobs did. 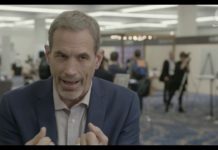 As the world continues to advance and move further along, what people need to know, and do, and be capable of, is growing also,” says Parker, who describes the skills gap as a profound industry problem. Toyota decided the radical solution was a talent development approach that gave young workers all the skills they needed to hit the ground running. Seven years ago, AMT, an intensive, two-year program that combines classroom and lab work, with paid on-the-job training, was born. What started out as a Toyota-only initiative now has more than 300 companies participating in nine states, partnering with 22 community/technical colleges and three universities. The collaborative of companies works together under an umbrella group they call FAME, the Federation for Advanced Manufacturing Education. “It turns out that our problems are not unique to us by any stretch of the imagination. They’re common, really, to any employer of technical talent. 3M makes Post-It notes, makes tape. Down the road from us here in Kentucky is GE Appliances. You go beyond manufacturing and you have companies that also need employees with technical talent—L’Oréal Cosmetics, Jack Daniels, Perdue Farms,” says Parker. AMT’s first step in recruiting students is visiting middle schools and high schools, promoting STEM and touting the advantages of entering the career path program, from tuition cost to a quicker entry into the workforce, to job satisfaction. Parker acknowledges that manufacturing can be a tough sell to students, especially those who have math and science skills. “If you’ve got a really capable student, especially one who has an orientation towards STEM, and they express an interest in pursuing a trade that’s based on a two-year program, or they express interest in going to a community college instead of a university, everybody’s horrified,” says Parker. He says parents, teachers, and counselors argue to their children and students that they are “better than that. More capable than that. That (manufacturing) wouldn’t be challenging to them. We have a national misperception that really smart students are not the right students for technology. 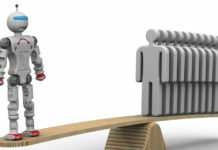 The perceptions we have in how people choose what they do, or encourage others to do—which are based in old manufacturing—contribute to that job skills gap,” according to Parker. 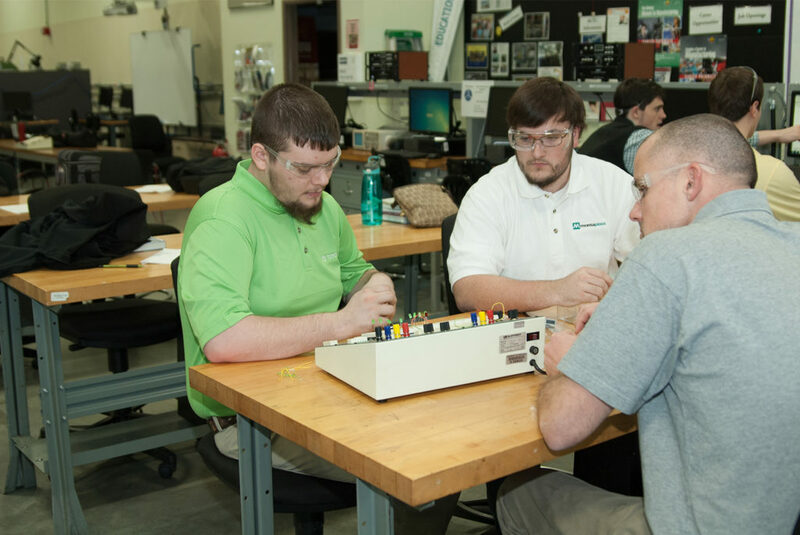 Once accepted into the program, the students immediately start learning the skills needed to get a high-tech job. “We’ve basically got every day of their learning life planned for them for the next two years—eight-plus hours a day, five days a week, five straight semesters. It’s two days at school alternating with three days at work. We achieve maximum impact with that,” says Parker. KYFAME for Students from KYFAME on Vimeo. And while it’s not guaranteed, many of the graduates end up working for their sponsoring company, earning an annual starting salary ranging from $50,000 to $75,000, depending on the employer and hours worked. “Over 90% of the graduates will actually employ with their original sponsoring company,” explains Parker. “The AMT graduate is so far ahead of the regular graduates. For more on the Kentucky chapter of FAME: click here.